I’m a big fan of the saying, “In a world where you can be anything, it’s best to be kind.” There’s real value in a good-natured disposition, in a willingness to help and be humble, and to developing a reputation untarnished by scandal. The C-level Admin for Your Department: These folks are typically incredibly skillful and well informed. They can also provide thoughtful guidance on everything from when and how to approach the head honcho to insights on the daily schedule that could impact those plans. The Chief of Staff:If the Admin provides the beat of the day, these folks supply the lyrics. They know the hot topics and key content so buddy up to get in the know. Someone You Can Teach:It doesn’t matter if they are older, younger or even in your dept. Earn a reputation for helping others and it will pay back handsomely when you need to build your next team. Someone You Can Learn From: Get a mentor and don’t be shy about it. The ability and willingness to learn new tricks is hallmark of success. Your Finance Partner: Make sure you understand how the business makes money and your role in that process. If you’re already a financial whiz, great. Consider what you know about sales, marketing, operations, etc. Find the missing piece and then get to know the respective guru down the hall. 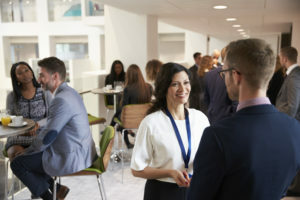 While a formal mentor can give you specifics about your role (and the next one), these informal connections can broaden your overall professional view. Posted in Blog and tagged networking, tim toterhi.